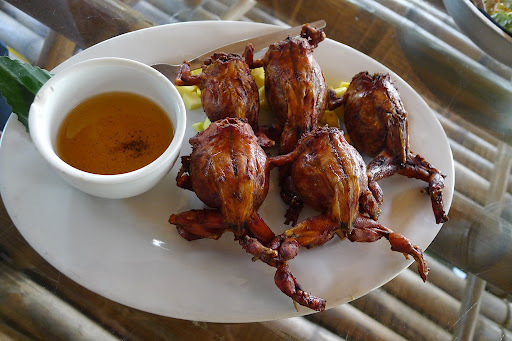 The frog has always been a part of Kapampangan tradition and culinary culture - here from authentic and posh restaurants to the by-the-street-side eateries, a dish of frog is a common menu. The famous is 'batute' or deep-fried frog stuffed with lots and lots of meat and vegetables. It looks wild but it tastes great. 1. In a bowl, combine the ground pork, minced garlic, salt, vinegar and ground pepper. Set aside. 2. Clean the frog and remove the skin, head and cut the belly to remove the intestines. 3. Use the ground pork mixture as belly stuffings. Sew to prevent the stuffings from spilling out. 4. Mix the marinating mixture: salt, vinegar, ground pepper and brown sugar. 5. Pour into the stuffed frogs. 6. Let it stand for 30 minutes. 7. The let it sund-dried for another 30 minutes. 8. Deep fry until golden brown.